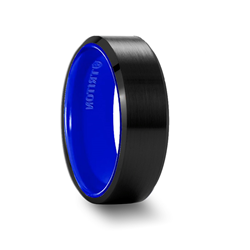 The leading tungsten wedding bands retailer, Larson Jewelers, announces they now have Summer/Fall 2014 ring styles from Triton Jewelry for sale on their website. Triton has over 400 styles of rings. Most jewelry stores only have about 20 to 30 of Triton’s styles in their display case at most. Couples going to jewelry stores to look at Triton rings are only seeing a small fraction of all the beautiful styles that Triton has to offer. Larson’s website is one of the few places that couples can now see all of Triton’s designs in one place. Larson strives to consistently update their website to make sure they are carrying all of their manufacturers’ most current styles. Other websites are slow to update their product offerings. Triton’s Tungsten Air line features a lighter weight tungsten ring that is naturally white, which means it has no plating and is white all the way through. It also comes with an inner band of color for a sporty fresh look. Colors available are red, blue, black, and white. This line is geared towards younger males who are active and want a ring that shows this. Their rose gold and yellow gold colored tungsten rings line offers people the opportunity to have rings that look like rose gold or yellow gold, but retain the toughness of tungsten. “The people at Triton Jewelry are some of the hardest working people I know.” says Vanessa LeBeau, Marketing and Merchandising Manager for Larson Jewelers. “They are constantly churning out beautiful new styles of rings and I can’t wait to start showing them to our customers.” LeBeau continues to say. All Triton Rings come with a manufacturer’s lifetime warranty, which covers size exchanges for life, and repair or replacement in case of accidental damage. It is part of their policy to only carry brands from manufacturers that stand behind their products. Frederick Goldman, Inc., the parent company of Triton Jewelry, began in the 1940s as a small manufacturer of plain wedding bands. Over the years the company grew due to their reputation for high quality and innovation. Today, they have become the largest wedding band manufacturer and wholesaler in the US. Triton Rings specializes in contemporary metal wedding bands for men. It is one of the most recognized name brands in the wedding band market today. Jewelry stores all across the US carry their rugged tungsten, cobalt, titanium and stainless steel wedding bands.